Review: My first jump into a fitness tracker came just after Christmas where I decided to try out a Fitbit tracker. The overall intent was to of course ensure I stay active and help keep me on track to prepare for the sport we all love, OCR. After about 7 months of using this product and enjoying it I found myself wanting more. Knowing that the Fitbit is not waterproof I was hesitant on bringing it out on the course and typically made good judgement on doing so. Just like many people though it killed me to not get those steps counted towards my overall day after a race. I could not use the time, distance and heart rate functions while competing. Of course I did try it at a course and you guess it, my Fitbit is now in a better place. After looking around I decided to go with the TomTom Spark Cardio + Music. I wanted something that I could use daily to track fitness goals, but would also be extremely valuable on the courses. I was sold on the TomTom due to it having the daily features for goals, ability to store music and it was created to handle an OCR. Another bonus and hint if you decide to buy this watch. When you order the watch through the TomTom website they include the bluetooth headphones for free. That is a nice value you can’t pass up and so far they have worked extremely well. Uploading the music onto the watch was about as easy as it could get. The TomTom app automatically linked with iTunes and I was able to move a created playlist right onto the watch. The watch will hold up to 500 songs which I feel is more than I need. Also, good to point out that the pairing of the TomTom headphones was very easy and using daily is also very easy. All I need to do is let the watch know I am turning the headphones on and as I do so they start playing right away. The ear pieces fit into my ears perfectly and have yet to feel like they will fall out (they give you different sizes) and sound great. 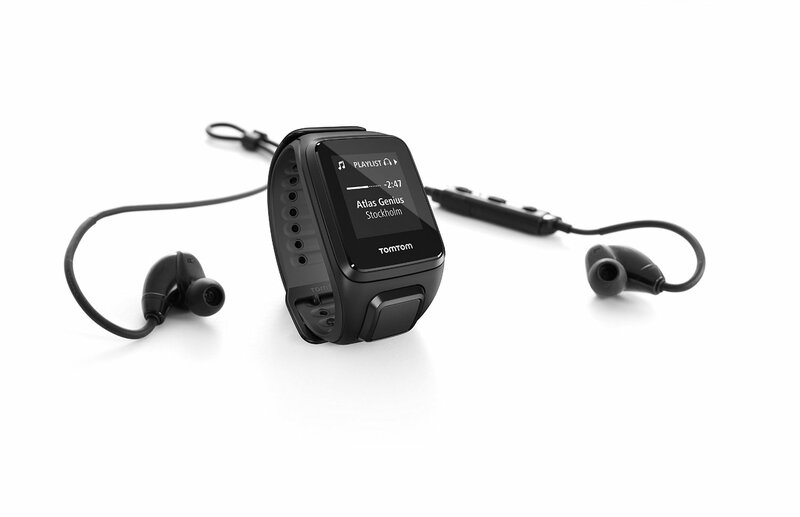 This watch has multi sport capability so you can set it for multiple workouts which is nice. I really like how when you select an activity such as running the watch quickly picks up your heart rate and then locates you with GPS. Once it has both it literally tells you it’s ready and you can start. I will say that while running the Spartan Super it showed to be very accurate with my heart rate and distance. Each time I hit a mile marker on the course my watch was pretty much right with the marker. You can also display multiple views on the watch so whatever is most important for you is easily visible. If you want heart rate to be visible or pace or just time of day it is no problem. I also enjoyed how it broke down your run and gave you all the stats you would need as well as showing the map of where you actually ran. I’ve never had that luxury so that was nice. If the TomTom was lacking in anything I would say it is in the mobile phone app. I think it could sync to the watch a bit easier (the Fitbit for instance would automatically sync when opened). Also, while it does give you your workout details and race details. As far as normal daily activities it only tells you your steps for the day and week. I would like it to have more info around daily activities like the Fitbit app. When looking at design I think it is a great looking watch. It fits very comfortably on my wrist and does not look too big or clunky. It can easily be worn like an everyday watch in my opinion. The display screen is also very easy to read during a sunny day. The actual straps of the watch are very comfortable. It has the ability to be switched to different colors and is extremely secure on your wrist. I have never seen a watch clip in three different places like this one does. Great for doing OCR as far as peace of mind goes. There is no way that watch is falling off your wrist. While this is really my first crack at a multi sport watch I definitely feel like I made the right choice. I love having the ability to have music when running without the need to carry a phone or iPod and it works extremely well. I have had no issues using the watch so far after about 3 weeks and would recommend it to anyone.